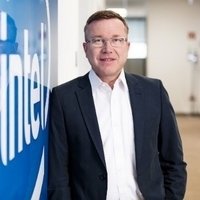 Stephan’s responsibilities include the positioning of Intel products and solutions in the High Performance Computing (HPC), Analytics and Artificial Intelligence environment. Together with his cross-site and inter-organizational team, Stephan Gillich plans and implements strategies for the European region and the Middle East. Stephan Gillich joined Intel as a Computer Scientist in the Supercomputing Division. Since then, he has gained comprehensive expertise on clients and servers in numerous business areas and he has held various management positions with responsibility for technology and the positioning and marketing of relevant products for businesses, industries and end-users. As a member of the steering committee of the Digital Video Broadcasting Project (DVB) he has also worked towards the expansion of unified standards in the media industry. Stephan Gillich holds a degree (Dipl. Inform.) in Computer Science from the Technische Universität München.